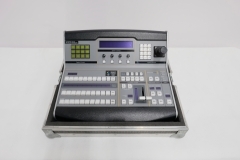 Powerful video production with simple and intuitive video mixing and switching. Eight video channels including two computer inputs. DSK (Downstream Keyer) enables graphic and title overlays. Ideal for any live event and presentation. 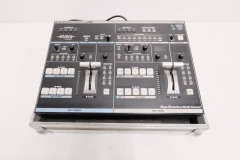 The LVS-800 is a part of the Roland SD video mixer line. The V-8 offers an expanded visual experience and is the natural evolution of the legendary V-4 Four Channel Video Mixer. The V-8 Eight Channel Video Mixer has all the features of the V-4 but with more channels, two selectable RGB inputs, monitor outputs and additional powerful special effects. 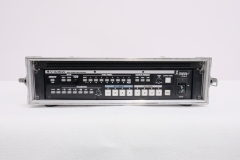 It continues the legacy of the V-4's other great features such as ease of use, high-quality digital processing of video, numerous video effects and BPM sync with music. This next generation video mixer expands your visual presentation and performance potential to new applications and dimensions. The VR-3's innovative design incorporates a video switcher, audio mixer, preview monitors and streaming-ready USB output all in a single unit. As a USB Video/Audio class device, web streaming is effortless by simply connecting to a computer running a live streaming service such as USTREAM , Livestream, Stickam, Justin.tv, worshipstream.com, websharelive.com, etc. The reduction in hardware equipment, setup time and connection complexity ensures a worry-free, easy to use solution for any event.